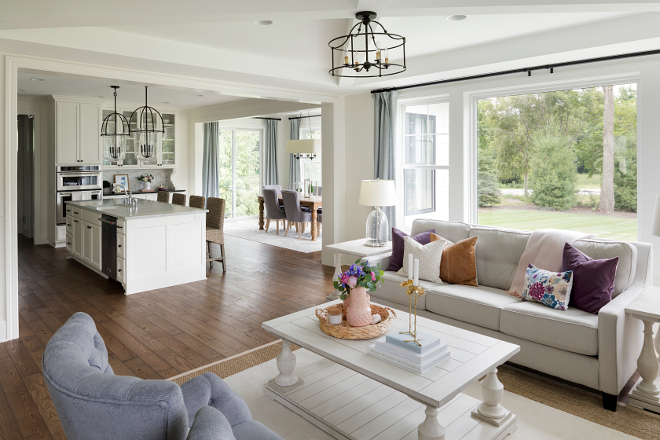 Built by SD Custom Homes and with interiors by Bria Hammel Interiors, this family home features a truly inspiring floor plan. 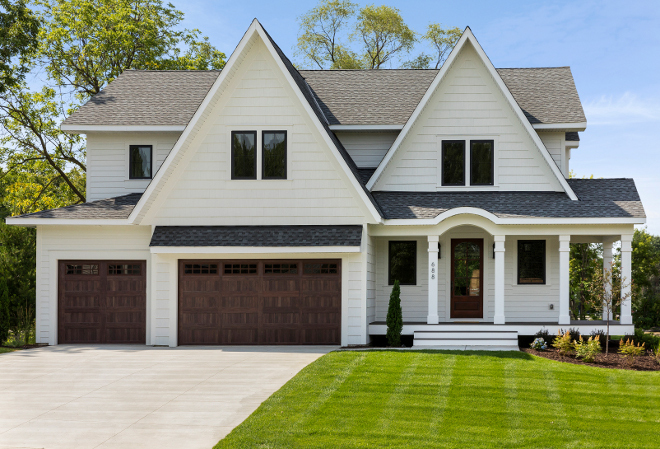 The stunning exterior opens up to a 4-bedroom, 3.5-bathroom space that is as perfect for elegant entertaining as it is for young family living. 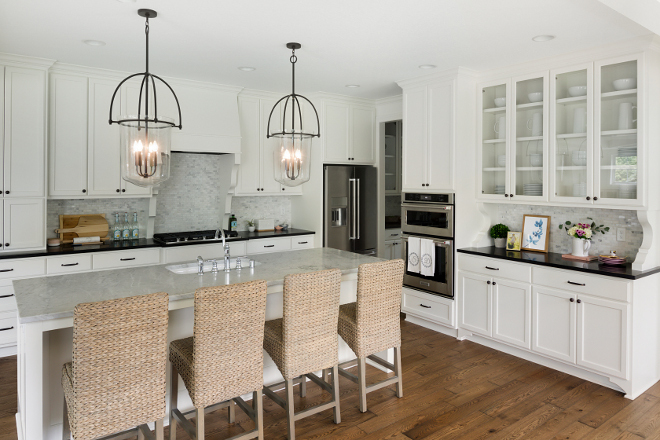 A well-thought-out floor plan showcases special details throughout the home: Kitchen cabinetry features decorative accents, the foyer boasts classic millwork, and beautiful wallpaper puts the exclamation point on an already spectacular living space. 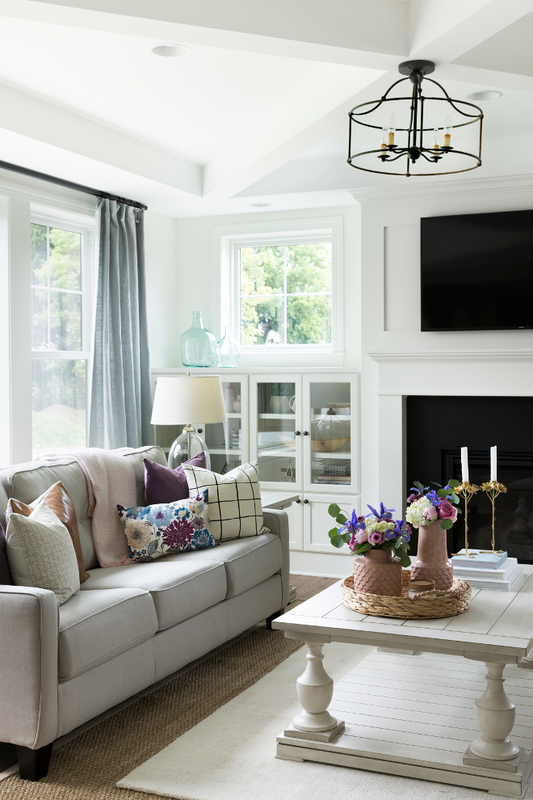 Take notes on paint colors, lighting, decor and more! 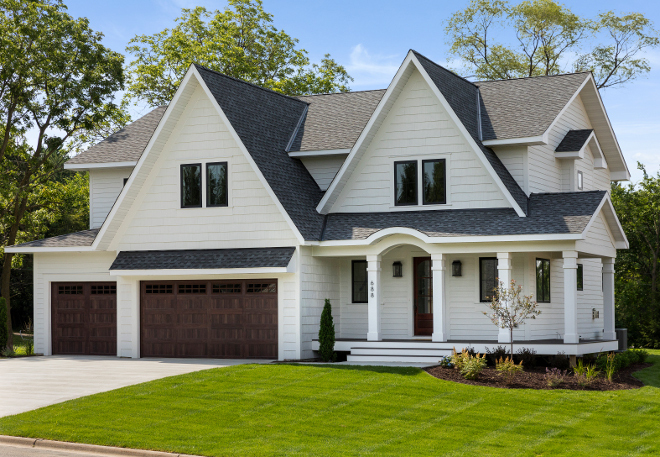 Exterior Siding: Hardie Board Prefinished Arctic. 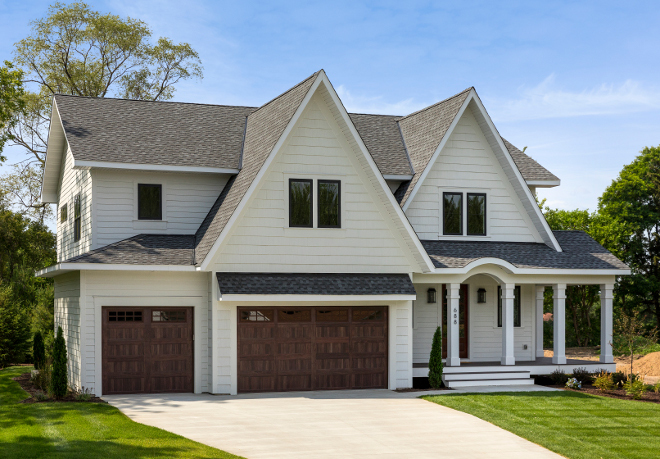 The wood grain garage doors compliment the front door and black-framed windows. 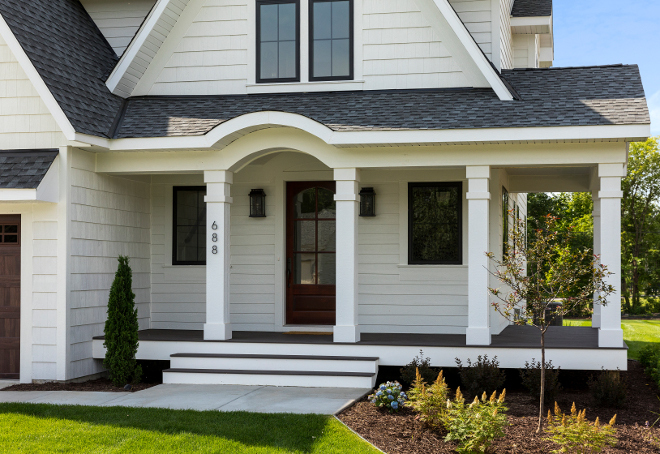 This gorgeous glass and wood front door is custom. You fall in love with this home as soon you step inside! Lighting is Robert Abbey Blake Flushmount. Runner is Dash + Albert Birmingham Rug. Interior paint color is Benjamin Moore Swiss Coffee OC-45. Grey Barn Door Paint Color: “Sherwin Williams SW 7066 Grey Matters”. The foyer opens to a small but well-designed home office with barn doors. 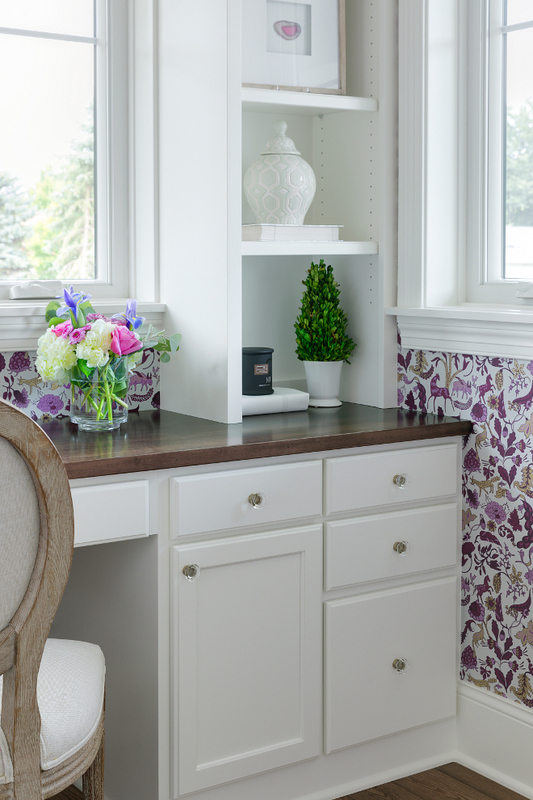 Office Wallpaper: Hygge + West, Foret in Plum. The glass knobs are by Amerock. Medium stained oak hardwood floors contrast with white paneling. Flooring is Pre-finished white oak. What a stunning and soothing living room. 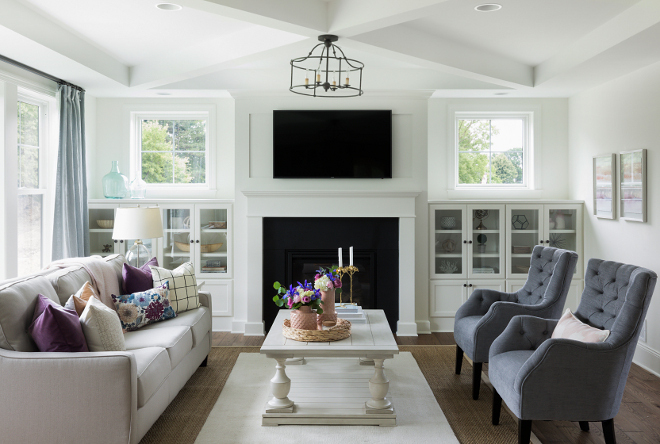 I love the furniture layout, the custom built-in cabinets and the sheetrock x ceiling detail. 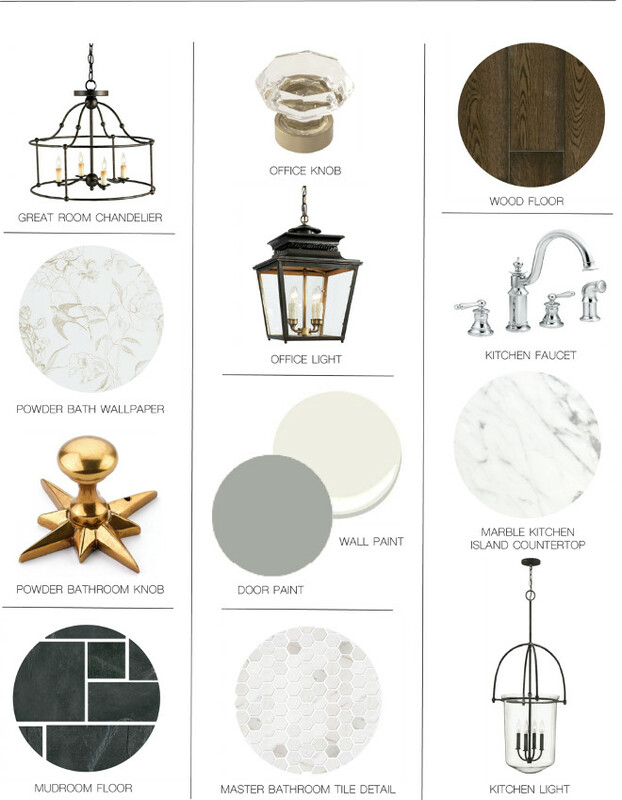 Paint color is Swiss Coffee OC-45 by Benjamin Moore. 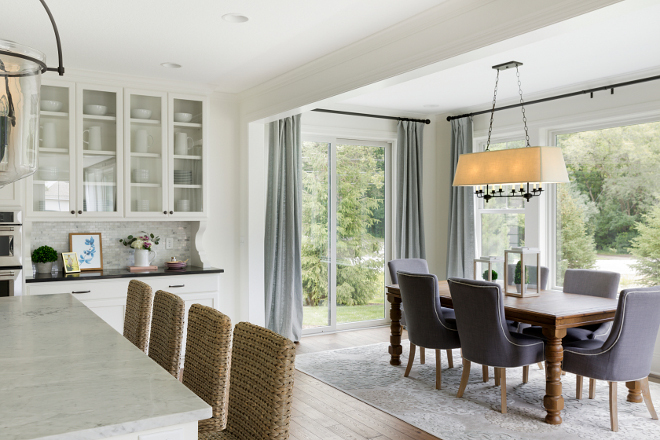 Lighting: Fitzjames Pendant by Currey & Company. White balustrade square coffee table can be found here. Fireplace surround is Black Honed Granite. The living room opens to the kitchen and breakfast nook. 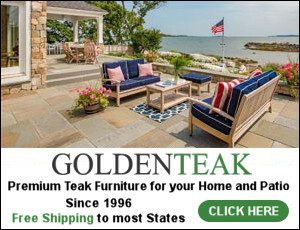 Cabinets and wall paint color are also Benjamin Moore Swiss Coffee. Notice the great layout of the cabinets. 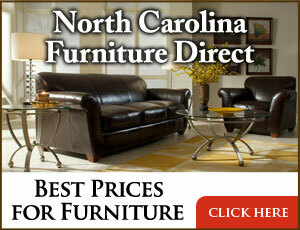 Kitchen counterstools are Target Andres Hardwood 24 Counter Stool – Gray. 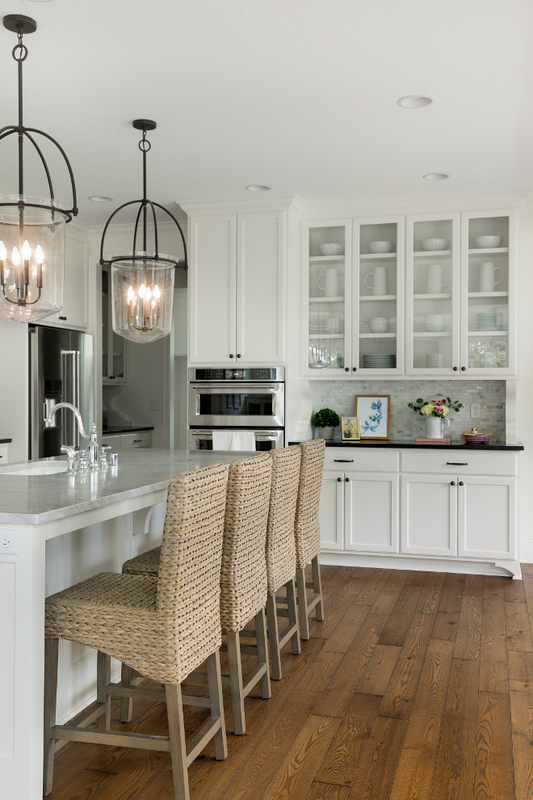 The island countertop is Carrara marble. Lighting is Hinkley Clancy. Backsplash: Tile Shop Hampton Carrara Cardine. Perimeter Countertops: Black Honed Granite. Faucet: Moen Waterhill in Chrome. The breakfast nook features plenty of natural light. Notice the peaceful view. Draperies are Pottery Barn Emery in Blue Dawn. The kitchen opens to a butler’s pantry – a practical mudroom comes next. This is a cute yet practical mudroom. The durable flooring is slate tile. 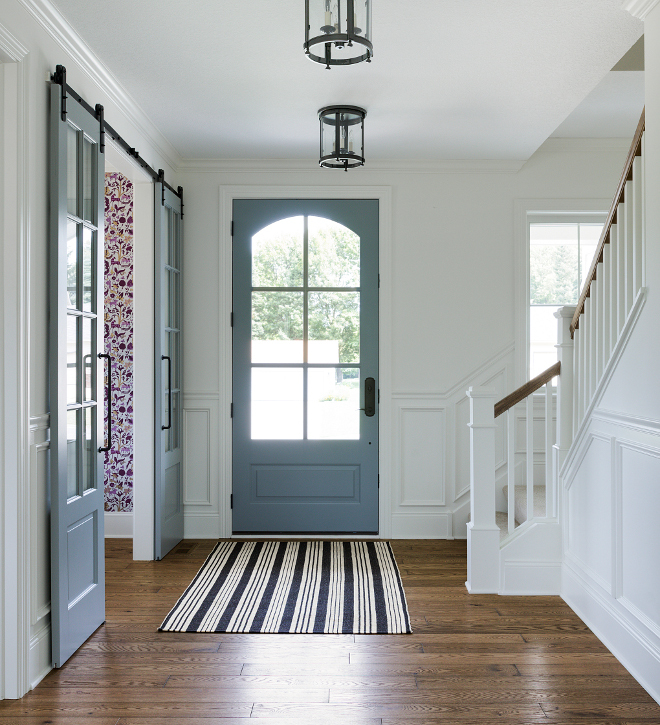 Mudroom runner is Loloi Magnolia Home Carter Rug. 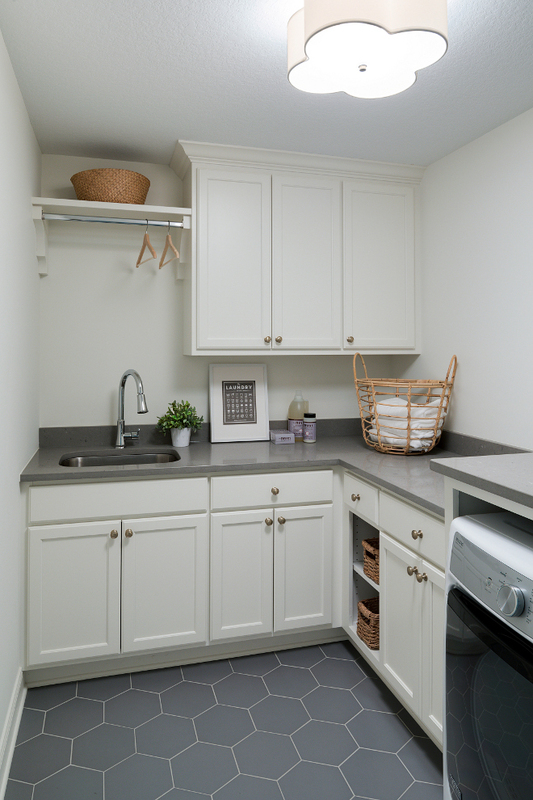 The laundry room features grey quartz countertop and grey hex floor tile. Flooring: Tile Shop Silver Hex. Countertop: Q Premium Quartz Fossil Grey. 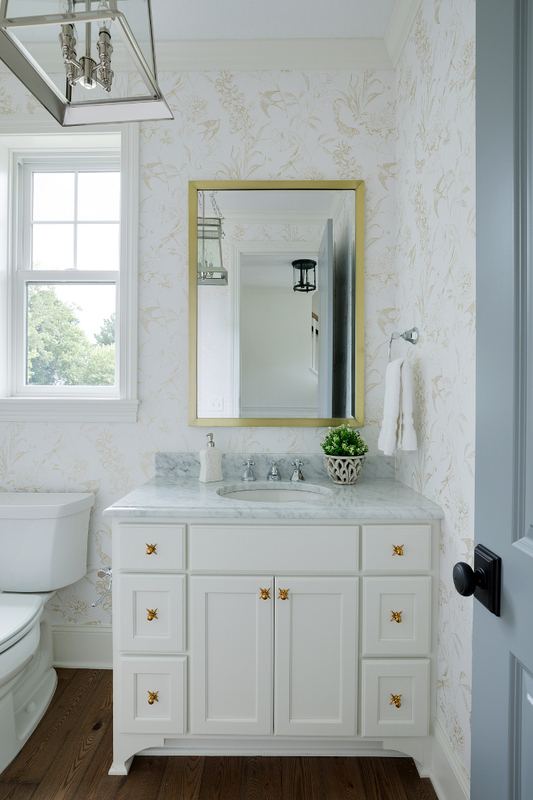 What a darling powder room! Wallpaper is Designers Guild Sibylla Garden. 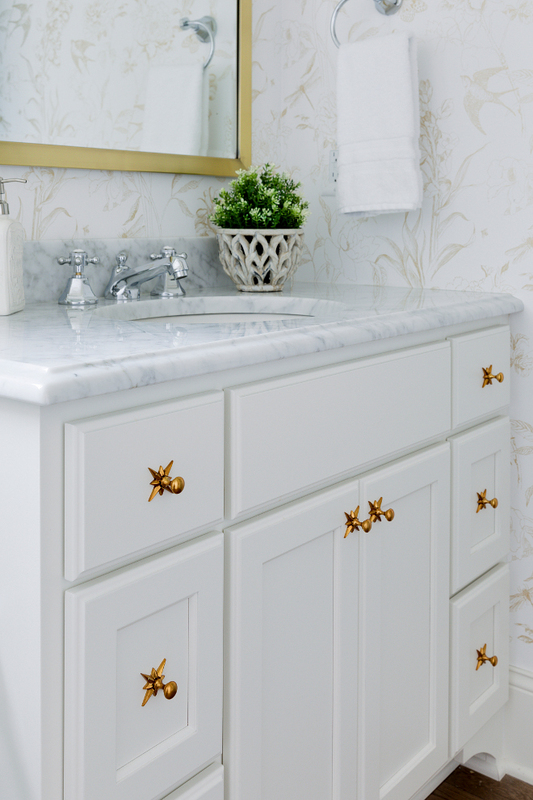 Countertop is Carrara marble. Lighting is Savoy House Norwich Lantern. 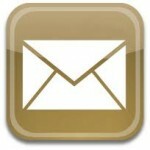 The brass knob is Schaub Symphony Knob. Cabinet color is BM Swiss Coffee. Faucet is Mirabelle Boca Raton. The landing area opens to a flex room, currently used as a playroom. Isn’t it adorable? 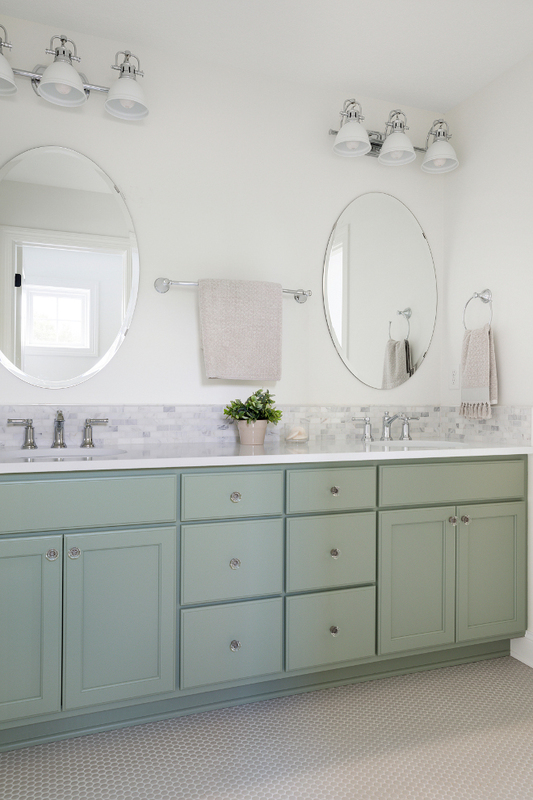 Cabinet paint color is “Benjamin Moore Salisbury Green HC-139″. 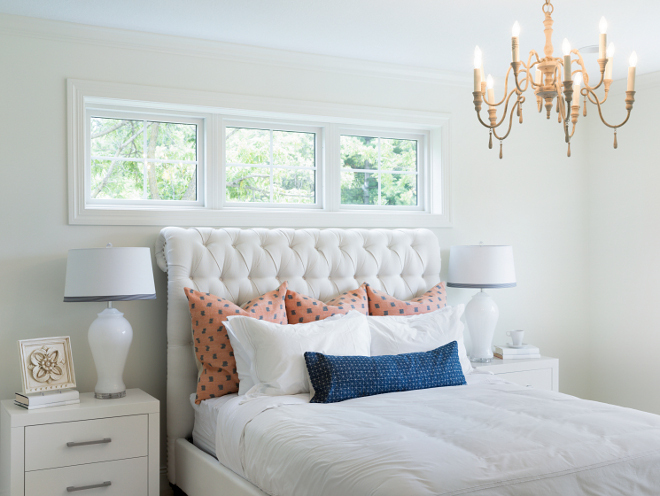 The master bedroom feels so bright yet cozy! The paint color is Benjamin Moore Swiss Coffee. 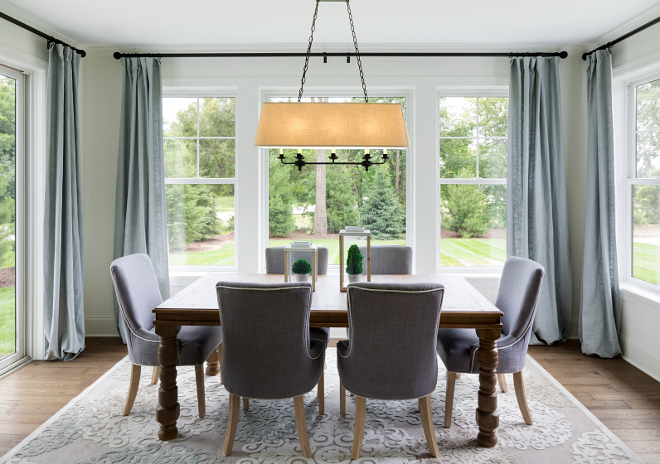 Lighting is RH Baby Lutece Chandelier-Oatmeal. 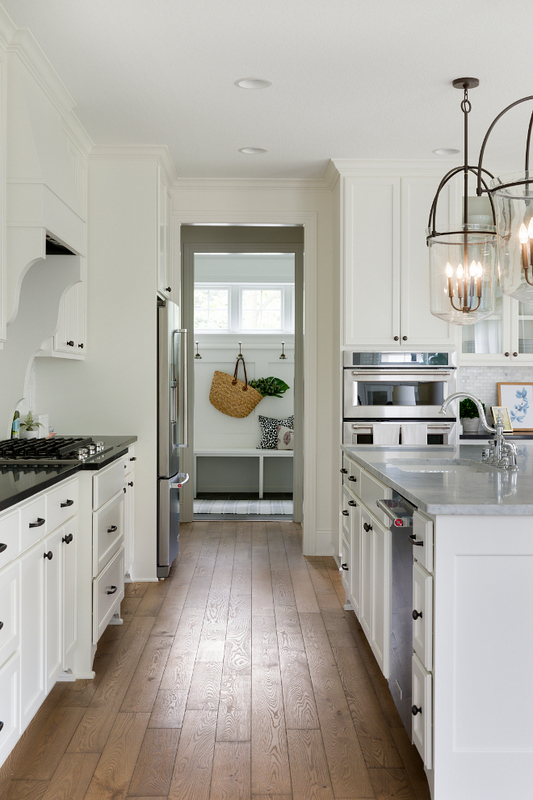 New Classic White Kitchen – Renovation Inspiration. What a beautiful family home! I love seeing homes that are bright and well-designed like this one. Have a Blessed day, my friends. We’ll talk tomorrow! This is a really lovely family home. As you say the playroom off the landing is adorable. I love the dusty blue chairs in the living room. Do you know where they’re from?